Summertime is here and it’s time to bring on more popsicle recipes! 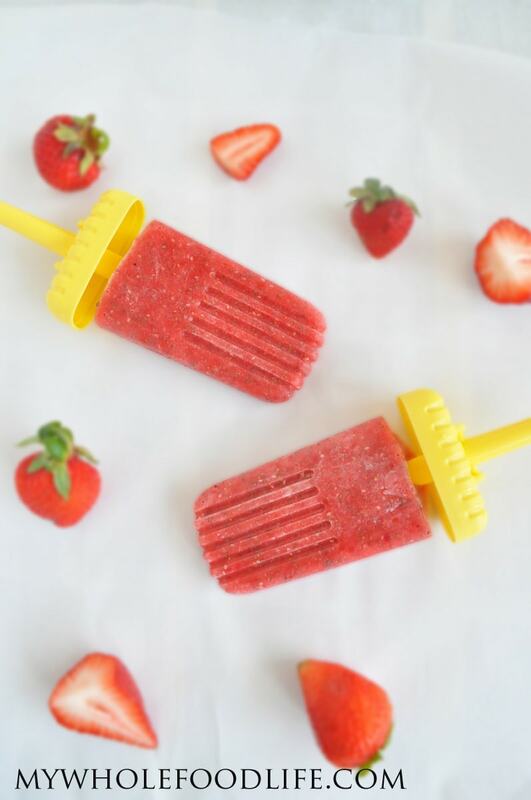 Starting with these Healthy Strawberry Popsicles. Who doesn’t like popsicles? My kids love them, but the store bought versions usually include artificial dyes and processed sugar. You can easily make your own popsicles with just fruit as the ingredient. I added the chia seeds to my strawberry popsicles because I like to add in a little healthy fat and also fiber. These homemade popsicles are so simple. They have no added sugars. Vegan and gluten free. They take less than a minute to throw together. It takes the popsicles about 6 hours in the freezer until they are ready to eat. They they are there in the freezer for you to enjoy anytime! I love these popsicle molds ! They have a drip catch it’s less likely to make a mess. I know all you moms can relate! 🙂 If you don’t have popsicle molds, you can probably make this a sorbet in an ice cream maker . These would really work with any fruit. I imagine raspberry, blackberry or even kiwi would also be delicious. So go crazy with all the fruit and eat popsicles all summer long. A simple treat with a dose of healthy fats! Blend the 2 ingredients in a blender for about 2 minutes. Pour into popsicle molds and place the molds into the freezer. Enjoy! SO easy, love these! Seriously, what an awesome and healthy treat for the kids over the summer! Thank you! This is a the perfect after dinner treat. I will be making these today. You are so welcome Nikki! I hope you enjoy them. I'm really excited to try this recipe. I was wondering if you heard about the chia seed recall? I just bought chia seeds for the first time at Trader Joe's. They were NOT part of the recall, but now I'm a little paranoid that I should wait to make sure that they aren't included. I did hear about that. I think it's just the chia powder. I have been using the seeds without any issues. I get mine at Natural Grocers. Making this with blueberries that I have, today! What a refreshing recipe for the summertime! Was thinking of using mixed berries to make some popsicles, woukd you suggest using 4 cups of berries as well? You inspired me to buy popsicle molds so excited to make some! Thanks! Made these today with a mix of strawberries and raspberries (and the chia seeds). Our dinner guest and my toddler loved them! Loved the drip catching Popsicle sticks you recommended also! Thanks. This recipe seems so easy! I can't wait to make these tasty treats, especially since summer is here! Thanks! It's a favorite of my kids! In the ingredients, does "T" refer to tablespoon?? ?